... was there a double impersonating Oswald? Determined to learn Oswald's last words, his only testimony, The People's Almanac assigned one of the leading authorities on the Kennedy assassination, Mae Brussell, to compile every known statement or remark made by Oswald between his arrest and death. The quotes, edited for space and clarity, are based on the recollections of a variety of witnesses present at different times and are not verbatim transcripts. " After 14 years of research on the JFK assassination," Mae Brussell concludes, "I am of the opinion that Lee Harvey Oswald was telling the truth about his role in the assassination during these interrogations." In 1948, under subpoena before HUAC, Whittaker Chambers named Abt among members of the Ware Group. Abt refused to give testimony. Jim Marrs, Author "Crossfire: The Plot That Killed Kennedy"
A MUST HEAR - Abraham Bolden, first black Secret Service agent while Jfk President. He exposed corruption in the secret service, who is run by the Treasury dept. Some agents hated JFK and said they would not take a bullet for him, yet their job was protecting him? Bolden stopped a murder attempt on JFK in Chicago. The scum charged Bolden, drugged him, tried to kill him, and put him in jail. They feared the truth coming out i.e. OTHER THAN THE OFFICIAL STORY THAT IT WAS OSWALD. BOLDEN KNEW OTHERS WERE INVOLVED! Very interesting! (Starts time 44:15 but whole interview is interesting!) Nick Begich on Dr Janda reveals interesting facts about former Congressman Hale Boggs who was murdered in plane crash. Boggs was on Warren Commission and did not believe the findings. He also saw FBI Hoover as corrupt. Knew too much? Nickâ€™s dad was collateral, as he died in the same plane crash. Begich also said that Bill Clinton drove Boggs to the airport that day. Amazing! REP. BOGGS: I have talked to a friend of mine who told me about riding to the scene of the tragedy, the hospital, and he told me what transpired in the hospital room, and the extent of the wounds. In fact, the President was undoubtedly dead before he ever arrived at the hospital. None of this appears in these reports. Nothing but the autopsy. That is the truth: OSWALD DID NOT KILL JFK! MUST HEAR Boldenâ€™s first interview with Dave Janda! Bolden was framed for trying to protect the Presidents life! OUTRAGEOUS TREATMENT OF THIS GOOD MAN! THIS IS MORE PROOF THE OFFICIAL JFK STORY IS A FABRICATION! I BELIEVE BOLDEN IS TELLING THE TRUTH! NOTICE: Those who ignorantly claim Alex is a racist! The above document was compiled by Infowars! 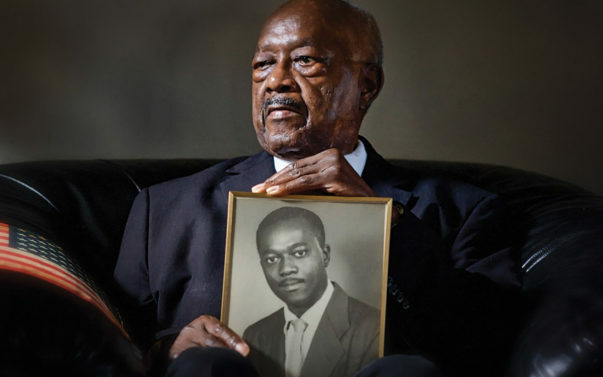 Obama had the chance to pardon this good man and did not do so. SHAME ON YOU, OBAMA! YOU PARDONED CRIMINALS, BUT NOT THIS GOOD MAN? SHAME ON YOU! He has twice appealed to the U.S. Supreme Court and asked Presidents Richard Nixon and Bill Clinton to grant him clemency. In March 2016, Bolden applied for a pardon from President Barack Obama. Typically, after a pardon application is filed, the Department of Justice reviews it. If it believes the claim has merit, the FBI is asked to examine the case. Former U.S. Pardon Attorney Deborah Leff estimated a backlog of about 10,000 pardon applications when she left the department in January 2015. To date, Bolden has still not received a pardon. It is with the deepest respect and honesty that I reach out to you. I feel a great deal of sorrow for actions involving my father which may have led to the death of your father. In 1963 my father, E Howard Hunt as a CIA officer, had knowledge of plans to eliminate your father, President John F Kennedy. I know this because my father confessed this to me shortly before he died. It is a burden I will always carry. I cannot imagine the loss you experienced at such a young age. In the ensuing years you have carried yourself with great dignity and reserve in the face of ongoing public speculation about your fatherâ€™s death. No one has ever, to my knowledge, offered any kind of apology for this horrible and unforgivable crime. It seems an insignificant gesture to apologize, but that is all I am able to do. Also states he went to Dallas jail same time as Ruby. Hum! Movie â€œ7 days in Mayâ€� came out months before JFK assassination. The movie was about a military coup, and filmed partly in DC. JFK requested the book be made into a movie as a warning to the public. "GHWB who was in Dallas that day "
Odds are Trump is using this as leverage over these agencies. I suppose itâ€™s also possible he fears heâ€™ll get the JFK treatment himself if he steps too far out of line. These animals need to go to prison. Are they about to be rounded up? They sure have been showing themselves lately out of fear of losing their power. Tick tock! Auctioneers are selling an extraordinary photo album of the moment Lyndon B. Johnson's was sworn in as president on Air Force One just two hours after JFK was assassinated - with Jackie Kennedy by his side, her jacket still splattered with her husband's bloodstains. 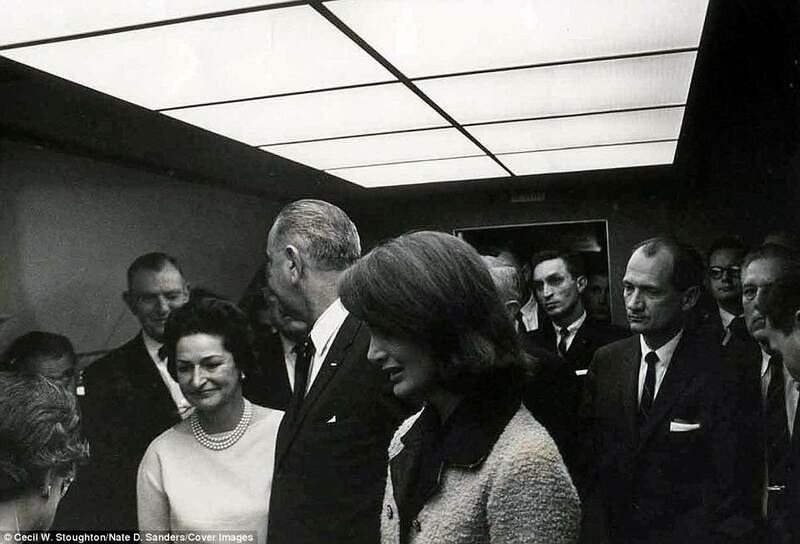 The 17 images in the album were taken by JFK's White House photographer, Cecil W. Stoughton, and they begin with LBJ and others waiting in the small 16 sq ft stateroom aboard Air Force One for Jackie to arrive. Several people are then shown comforting Jackie, finishing with Lady Bird smiling after her husband is inaugurated President. Nov 22, 1963 - The "Wink"
Thomas was a member of the Suite 8F Group, a group of influential businessmen that included his college roommate at Rice University, George R. Brown. Brown's company Brown and Root donated the land on which the Johnson Space Center would be located to Rice University. Then-Vice-President Lyndon Johnson was chairman of the Space Council, and Thomas, a member of the NASA board, played leading roles in the eventual acceptance of Rice University's offer. On 17th January, 1963, President Kennedy presented his proposals for tax reform. This included relieving the tax burdens of low-income and elderly citizens. Kennedy also claimed he wanted to remove special privileges and loopholes. He even said he wanted to do away with the oil depletion allowance. It is estimated that the proposed removal of the oil depletion allowance would result in a loss of around $300 million a year to Texas oilmen. Senator Abraham Ribicoff of Connecticut attempted to expose this scandal. He claimed that millions was being paid in kickbacks. An investigation by the General Accounting Office discovered that by 1967 RMK-BRJ had ?lost? $120 million. However, GAO never managed to identify the people obtaining these kickbacks. Another company associated with the Suite 8F Group also did well out of the Vietnam War. Bell Helicopter Corporation began producing the UH-1. It could climb 2,000 feet per minute and could fly at 125 miles per hour for about three hours. It could carry nine fully equipped soldiers and a crew of four. By 1969 Bell Helicopter Corporation was selling nearly $600 million worth of helicopters to the United States Military. According to Robert Bryce: "Vietnam made Bell Helicopters". Anti-war protesters decided that George Brown was the mastermind behind this corruption. Demonstrations against him took place everywhere Brown went. It got so bad that Brown advised Lyndon B. Johnson to withdraw from Vietnam. Brown told Johnson that if he did not do this, the war would destroy both men. It did destroy Johnson but Brown survived the protests. Johnson?s resignation as president was a body blow to the Suite 8F group. However, they had made preparations and John Connally had already got Richard Nixon involved with the group. He arranged for Nixon to meet fellow members at his ranch in Texas. This resulted in Connally becoming Secretary of the Treasury. However, they were not able to obtain the success that Johnson achieved in the 1950s and 1960s. The main reason for this was that they were no longer able to control the chairmanship of the important Senate committees. Robert F. Kennedy to Lyndon Johnson: ?Why did you have my brother killed?? The Suite 8F Group was instrumental in plotting, as well as coordinating, the assassination of President Kennedy. Two incidental moles, John Connally and Lyndon Baines Johnson, were directly involved in the assassination on behalf of the Suite8F Houston, TX,-based cabal. The bribery and racketeering trial in Washington, D.C., regarding the investigation of the acts of Bobby Baker was getting too close to home for the cabal?s comfort. Baker was a member of the cabal. The prosecution was headed by Robert F. Kennedy and supported by Jack Kennedy. Moreover, both these men wanted rid of the clique?s D.C. mole, Lyndon Baines Johnson. Therefore, Mr. Kennedy had to be eliminated. While LBJ and John Connally are culpable for the murder of this then sitting President, in fact, they are relatively low-level operatives. Even so, identifying them, confirming their role, is of utmost value in this investigation, because it leads directly to the ultimate criminals or near ultimate ones (admittedly, there are levels even higher than the Suite 8F Group, which are criminally associated). from "The Men Who Killed Kennedy"